Bulk orders from amlbook.com (EMSQRD LLC): contact us directly---non-US customers can enjoy faster shipping with the bulk option (7-10 days) than with the Amazon option. Machine learning allows computational systems to adaptively improve their performance with experience accumulated from the observed data. Its techniques are widely applied in engineering, science, finance, and commerce. 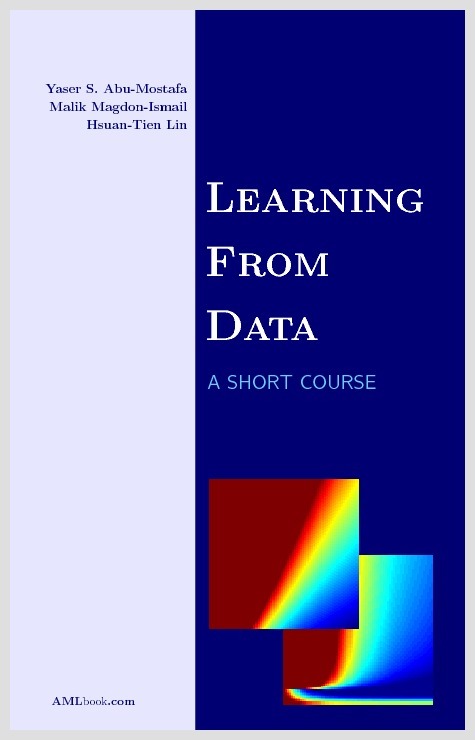 This book is designed for a short course on machine learning. It is a short course, not a hurried course. From over a decade of teaching this material, we have distilled what we believe to be the core topics that every student of the subject should know. We chose the title `learning from data' that faithfully describes what the subject is about, and made it a point to cover the topics in a story-like fashion. Our hope is that the reader can learn all the fundamentals of the subject by reading the book cover to cover. Learning from data has distinct theoretical and practical tracks. In this book, we balance the theoretical and the practical, the mathematical and the heuristic. Our criterion for inclusion is relevance. Theory that establishes the conceptual framework for learning is included, and so are heuristics that impact the performance of real learning systems. Learning from data is a very dynamic field. Some of the hot techniques and theories at times become just fads, and others gain traction and become part of the field. What we have emphasized in this book are the necessary fundamentals that give any student of learning from data a solid foundation, and enable him or her to venture out and explore further techniques and theories, or perhaps to contribute their own. 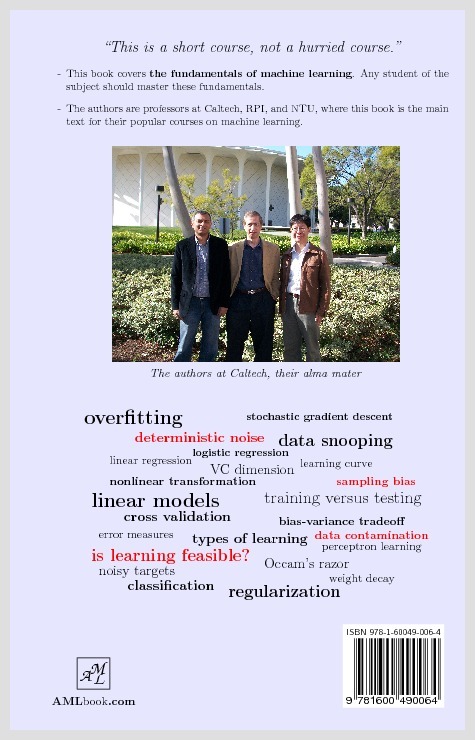 The authors are professors at California Institute of Technology (Caltech), Rensselaer Polytechnic Institute (RPI), and National Taiwan University (NTU), where this book is the main text for their popular courses on machine learning. The authors also consult extensively with financial and commercial companies on machine learning applications, and have led winning teams in machine learning competitions.